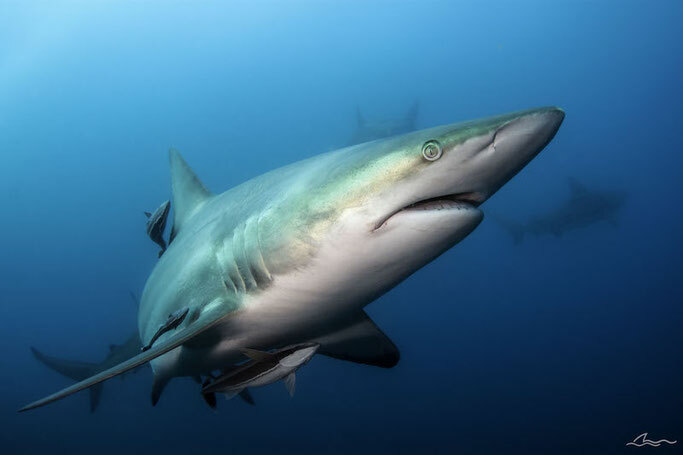 The Aliwal Shoal is a world-renowned shark diving site in South Africa where you will see various species of sharks all year round, a marine-protected area and Mission Blue Hope Spot. 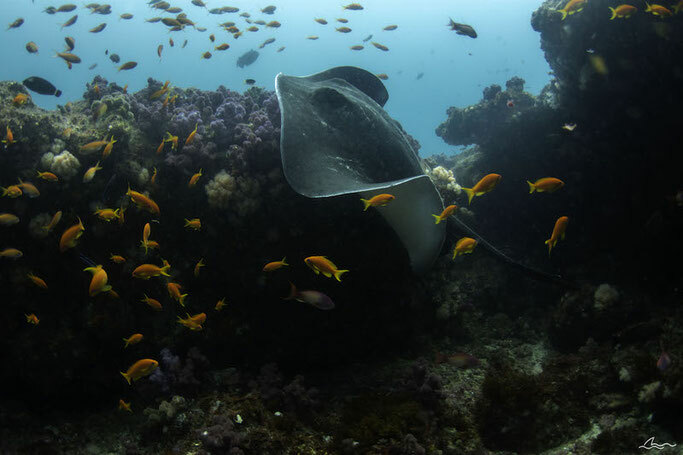 Whether you are a macro buff looking for nudies and paper fish or an adrenaline junkie looking for larger pelagic species, like sharks and rays, the Aliwal Shoal has some amazing scuba diving for you. The baited shark dives here at the Aliwal Shoal are one of a kind, and something that must be done at least once during your time here. With two baited drums full of local sardines and fish oil, the drums slosh in the current creating a scent trail that the resident oceanic black tip sharks follow in to investigate. During the summer months (Nov- March) tiger sharks are seen frequently and can be accompanied by a shy bull shark at times. Hammerheads can be seen as they migrate past in the summer months, as well as the odd great white shark! 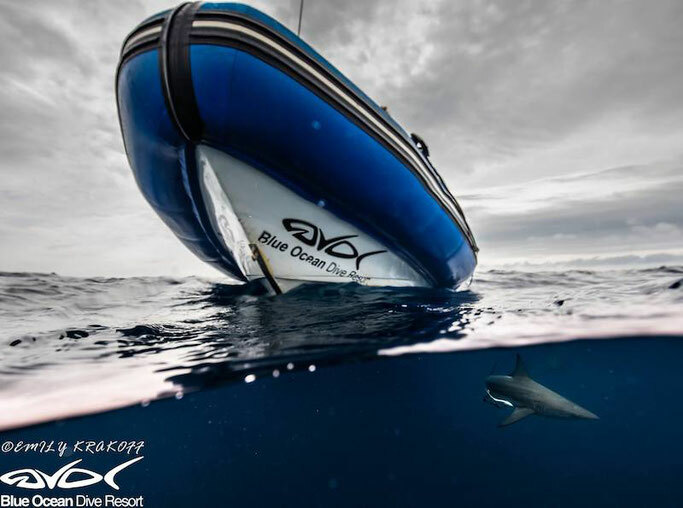 You never know what you may see on the Aliwal Shoal Baited Shark Dive! There is NO feeding/touching on this dive. It’s a great opportunity to get up close and interact with sharks in a positive manner while capturing the experience on camera. shark have all been seen here. This is a special dive site for new and experienced divers alike! Raggies Cave is a long cave sitting at 18m on the outside edge of the reef where the ragged sand tiger sharks aggregate during mating season. With something for everyone, Raggies Cave is rich in a variety of marine life, from ragged sand tiger sharks and rays to eels, nudibranchs and paper fish. As a bonus, there’s a large sandy patch in front of the cave where the Raggies like to congregate and roll in the sand to get rid of loose teeth and parasites. This makes it a great place to spend a few extra moments collecting shark teeth in the sand. This diverse site is located on the inside edge in the middle of the reef and has two different caves. One is a picturesque swim-through around 3-4m in length where pineapple fish used to be seen frequently (we’ll tell you about a bonus site later where we can find them now!) The other cave is where ragged sand tiger sharks like to congregate in groups of anywhere from 10-20 individuals. With a max depth of 12m, this is a popular site for OWD and DSDS, as well as snorkelers and free-divers with the shallowest part of the ridge at only 5m. A variety of species off rays are also seen here including spotted eagle rays and the occasional manta ray! The MV Produce is a large Norwegian cargo ship that sank in 1974 just a kilometre from the Aliwal Shoal. Laying almost parallel to shore, this wreck is easily navigated in both a N/S or S/N current and is best when the current is slow. At 168m in length, this impressive wreck is an advanced dive site laying at 32m with her shallowest points around 14m. The wreck is broken into three parts; with room to swim around and enter if qualified and planned. Teaming with life such as Moray eels, scorpionfish, brindle bass, large shark species and the endemic Harlequin goldie, the MV Produce is a dive not to be missed. North Sands is a big sandy patch that lays at the northern tip of the reef with a depth of between 12-15m. With its shallow depths, this is also a great site for snorkelers and free-divers as well, so if you aren’t yet certified, you can still enjoy parts of the reef! Its location at the edge of a drop-off brings in game fish such as barracuda and waho that like the crossing from deep to shallow. There are also lots of rays, including devil rays and manta rays, and ragged sand tiger sharks are seen here seasonally. Howards Castle is one of my FAVOURITE dive sites, even though it’s not visited frequently. At 2km further south than the rest of the reef and between 22 and 25m in depth, this dive site is best navigated by experienced DMs. This is where the baited shark dives are, so you’ll likely see oceanic black tips, the occasional tiger shark, and trevally on your safety stop. As you may have guessed, this site’s appearance mimics a castle, with lots of ledges, overhangs and swim- through caves where ragged sand-tiger sharks like to hangout. With macro finds such as nudibranchs and a few of the last known elusive pineapple fish on the Aliwal Shoal, this is a dive to enjoy slowly. Get your cameras ready! Blue Ocean Dive Resort (a GTS membership recommend dive centre who offers our members discount!) organizes personal shuttle service and luggage assistance to and from the Durban airport. You’re warmly welcomed by the owners and staff of Blue Ocean Dive Resort, a Padi 5 Star IDC Centre, as if you’re an old friend, and by the time you leave, you’ll feel like one! Whether it be a larger cylinder, a last-minute computer repair, tweaking your regs for you, or an appointment with a DAN approved dive doctor, they will ensure that your trip and every dive is as memorable as possible. The on-site restaurant has the best pizza in town (and beyond) and they only use paper straws! Blue Ocean Dive Resort is a family-run professional business with a fleet of their own boats, the very best skippers, and incredible dive masters, who know the reef like the back of their hands! Rae Du Plassis is the lead dive master and instructor and a fellow GTS member. She has been diving with sharks here on the Aliwal Shoal for over 10 years and is genuinely excited to “go to work” every day. 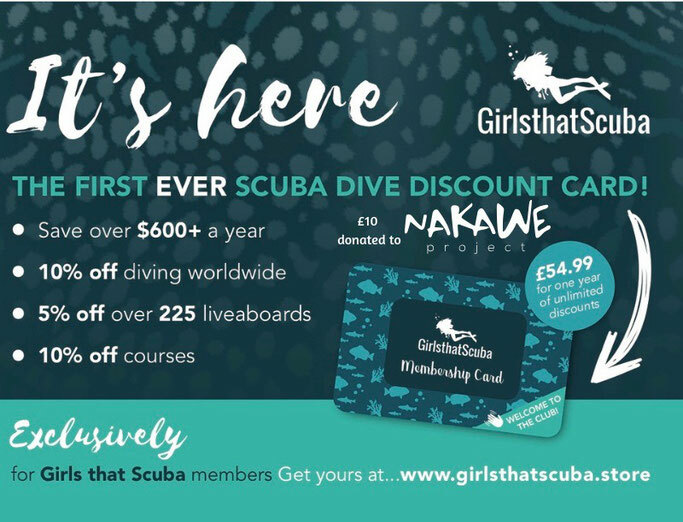 We also love that the Dive Shop is managed largely by a team of talented female staff and Blue Ocean is one of the Dive Resorts offering a discount to GTS members. GTS ROCK! Blue Ocean offers 10% discount on diving and accommodation for GTS membership holders. To get to Umkomaas, you will need to fly into King Shaka Airport in Durban, South Africa, which is about half an hour by private car hire from Umkomaas. Keep in mind that when travelling internationally, you MUST collect your checked bags in Johannesburg (point of entry in SA). These are rechecked at no cost to you, as they are tagged to your final destination of Durban. Andrea Kozlovic is a Canadian-born underwater photographer and avid scuba diver. In the 3 short years she’s been diving, she has accumulated 400+ dives on different continents all over the world. You can keep up to date with her dive travels, photography and conservation efforts, at www.makingwavesphoto.com and @makingwavesphoto on Instagram.